Once you become a mother you never stop learning, as what might have worked with one child, might not work with the following one. Every day brings fresh challenges and some are more pleasant than others. As a mother one of the biggest responsibilities we carry on our shoulders is keeping our children safe and while internet has brought many good things into our lives, it also has several negatives, including addiction and presence of strangers, actions of which we can’t always predict or control. Earlier this week I attended the ‘Online Safety Briefing‘ with the lovely Mary Rebelo, a teacher, a mother and a CEOP ( child exploration & online protection centre ) ambassador. In her ambassadorial role she attends schools, where she talks & teaches parents and children about various aspects of internet, paying particular attention to child safety. I thought I would compile a list of bullet points and share them with you, hopefully offering you some helpful tips and food for thought. – It isn’t easy keeping kids ‘safe’ online and being up-to-date with all the latest developments, as things develop and change incredibly quickly. – Children seem to be born with innate knowledge how to use computers, phones etc. There are now Apps being developed for babies as young as several months old. Its impact on their minds and eye-sight won’t be known for years. – YouTube might be great for watching videos, but sadly often kids can be exposed to inappropriate content and ads. – It is very important to have conversations with kids about online safety 7 start them from a young age. Goal posts will change and evolve as they grow and become more aware and tech savvy. – There are now plenty of online games where children end up playing with ‘strangers’. As an example – ‘Movie Star Planet‘, where one of the biggest ‘credits’ a child can get is through ‘dating’ someone. – Explain to children the need to be careful when it comes to private information; teach them to be polite but firm with saying ‘no’ to things they aren’t comfortable with. Make sure they know they can come to you with anything that troubles or concerns them, even if someone says otherwise. – Learn how to report things, if they happen. Many sites don’t ‘enforce’ things, unless things like inappropriate content or behaviour are reported to them. – Talk to kids about what games they play and with whom. Kids expect parents to be ‘mad’ rather than ‘interested’. Make sure you are an ‘interested’ parent. – More grown-up kids now use Skype, WhatsAp, Snap Chat, social media, OoVoo, Tango etc. to communicate with each other. Supposedly there is now Tinder for 13-17 year-olds…. – There is plenty of ‘non contact grooming’ online. – Read about parental controls when it comes to Smart TV, game consoles ( more relevant to boys ) etc. There is plenty of information available online, from sources like NSPCC or Childnet. 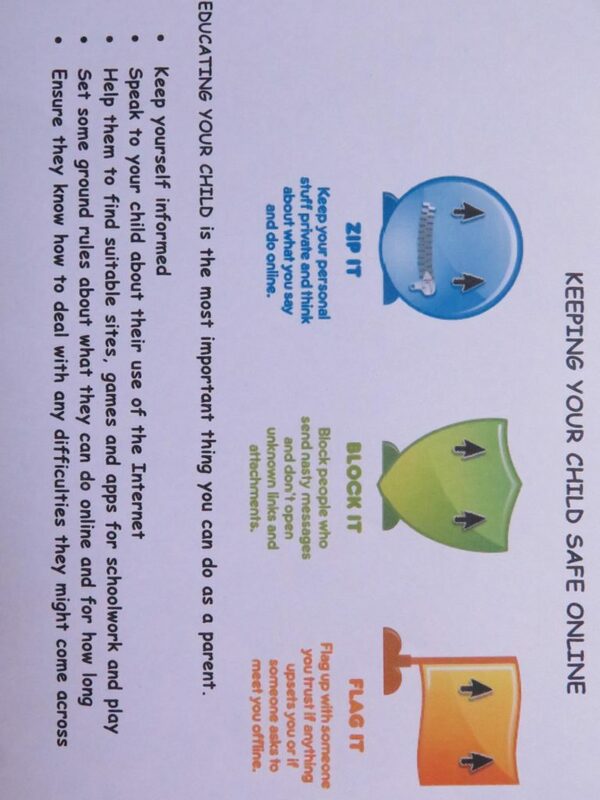 Remember that your child can access the internet not just at home but at friend’s houses, wi-fi hotspots etc. A quick web search for ‘how to get round parental controls on the Internet’ brings back about 18 million results ! – PEGI ratings ( entertainment content age rating ) are guidelines but not laws. – It’s not just grown-ups who develop internet addiction. The youngest reported clinic case was aged four ! So do watch the amount of time your child/children spends online. – Explain to the child that if they send their picture to someone, they often can’t predict where it can end up. Posting it on social media passes the ownership to the company, i.e you loose ownership of it. – Take time to watch CEON films, like Animal Magic or Jigsaw film. They are developed for different ages. Many schools do their best to stay ‘current’ with internet developments and take online safety very seriously, by teaching children, communicating with parents and making sure we all are aware of the importance of online safety. – Kids need to think about their actions and their consequences when it comes to their activity online and on social media. Sadly there is plenty of online bullying, peer pressure, eating disorder issues etc. – Try to stay ‘current’ when it comes to internet and social apps but don’t go mad. Just don’t be complacent ! – Make sure passwords are protected and kids don’t share them with friends. Give them example of knickers or toothbrush – they are not shared and changed regularly. So do change passwords from time to time. – Help your kids make the right choices. Ensure they know how to deal with any difficulties they might come across online. A lot of the information above might not be relevant to you as a parent yet, if your children or child are quite young but it doesn’t mean grown-ups shouldn’t take advice onboard. – Some councils, but sadly not all, as it often relates to funding, take the subject of child online safety very seriously and invest resources into being up-to-date and helping parents. Nowadays many schools also make sure stay current on the subject and teach girls & boys the importance of online safety, which starts from Reception onwards but is done age appropriately. I hope you will find the information helpful but not overwhelming.